With the dawn of a period of peace fruitful efforts were made to organize yachting as a sport. The Water Club at Cork existed only for the purpose of maintaining those pleasant customs set forth in its quaint original rules, and the convivial meetings and elaborate manoeuvres, with a prodigal expenditure of gunpowder, have little bearing upon the subsequent history of yachting. The citizen yachtsmen of the Thames rightly bear the distinction of setting up the first yachting organization, and while the members of the Cork Water Club disported themselves in their heavy cutters, the merchants and professional men of London industriously created a fleet of small boats, which subsequently paved the way for the organization known as the Cumberland Fleet. Thus the earliest organization of sailing matches brought about keen rivalry, and it is not surprising to find that the Cumberland Fleet increased in numbers and importance. An incident is re­corded in the Times of July 23, 1795, in which two of the boats – the Mercury and the Vixen – fouled in a race. The captain of the Vixen thereupon cut away the rigging of the rival boat with a cutlass ‘and fairly dismantled her.’ This incident, coupled with that of 1786, throws some light upon the ethics of sport at that period, though, as far as can be judged, it was generally carried on with hearty goodwill. Foremost among those connected with the earliest attempt to organize the sport appear the names of the Duke of Cumberland, brother of George III. ; Mr. Smith, first Commodore of the Cumberland Fleet; Mr. Thomas Taylor, Commodore from 1779 to 1816; Mr. Coffin, owner of the Caroline; Mr. Grubb, owner of the Eagle; Mr. Jonathan Tyars; Mr. James Gunston, owner of the St. George; ‘Mr. Astley, owner of the Eclipse; Mr. Byrne, owner of the Cumberland; Mr. E. Smith, owner of the Atlanta; Mr. Farebrother, owner of the Belissima; Mr. Edward Nettlefold, who appears to have succeeded Mr. Thomas Taylor as Commo­dore; Mr. L. Pickering, owner of the Busy; Mr. T. Edgebey, owner of the Mermaid; and Mr. W. Richards, owner of the Kitty. Mr. John Tyars was proprietor of the Vauxhall Gardens, and from 1786 to 1810 offered a silver cup and cover annually. The Duke of Cumberland ceased the presentation of cups in 1782, but trophies came from other sources, and only occasionally did the society subscribe for its own cups. It is impossible to decide the exact influence which these early sailing matches had upon the subsequent development of yachting or the formation of the Yacht Club at Cowes. The Yacht Club was formed in 1815, but for many years prior to that date yachts and yachtsmen were known upon the south as well as upon the west coasts Among these early yachtsmen outside the Thames were Mr. Joseph Weld, of Lulworth Castle; Mr. Sturt, of Branksea Castle; Lord Bolton; Mr. Gerrard; Mr. Nathaniel Ogle; Lord Craven; Lord Uxbridge, who was owner of the Liberty; and Mr. Assheton Smith. This race was called the Southampton Subscription Sailing Match, and was limited to carvel-built vessels not exceeding 15 tons. The time of rescue is given as near seven o’clock. ‘A few moments longer would have fatally closed the scene,’ concludes the account, and no mention is made as to the upshot of the race. These occasional matches were not the only signs of a growing interest in the racing of sailing vessels, and some sort of organiza­tion soon became apparent. In 1812 the first Isle of Wight regatta and sailing match was held, and the Trinity House pilots arranged a review of their pilot vessels. This regatta was witnessed by a number of private yachtsmen from their own vessels. Among these were Lord Grantham, Mr. F. N. Fazackerley, and Colonel Sheddon, who, three years later, assisted in founding the Yacht Club at Cowes. It is not surprising, therefore, to find that in 1815 a movement in favour of forming a club had so far advanced that on June 1 these gentlemen yacht-owners met at the Thatched House Tavern in St. James’s Street, London, under the chairman­ship of Lord Grantham, and succeeded in forming a club for those interested in the sailing of yachts in salt water. Despite its unique position and the fact that in 1817 the Prince Regent became a member, the Yacht Club was slow in developing and organizing the sport, and the annual procession or review and racing among local boatmen appear to have been continued. It is to private individuals that we are indebted for the matches sailed during the years immediately following the formation of the club. 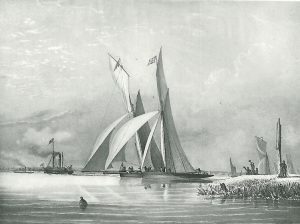 Mr. Joseph Weld, with the 60-ton cutter Charlotte, and Mr. Assheton Smith, owner of the 65-ton cutter Elizabeth – and who was, by the way, foremost in developing yachting on the Welsh coast – arranged a match for 500 guineas. The yachts were de­scribed as of beautiful model and construction and of celerity as quick sailers, and each owner confident of his vessel’s superiority. The match was arranged in three heats on successive days. On the first day, however, the Elizabeth lost her masthead in the race, and her sails falling upon the deck, she was disabled. Mr. Weld’s boat was leading, but after heaving to, the Charlotte returned, and towed the disabled boat back to port. Another match which created some considerable interest was sailed between boats belonging to the Marquis of Anglesey, Mr. Baring, and Mr. Weld for a sweepstake of 150 guineas. It was won by the boat belonging to the Marquis, who was credited with having won £800 by the event. The matches sailed at this time were chiefly those arranged by private owners, Mr. Weld being one of the leaders of the sport. In 1824 a race took place between the Julia, a yawl of 43 tons, owned by Mr. Weld, and the Giulia, of 42 tons, owned by Mr. C. R. M. Talbot, round the Isle of Wight. This was one of the earliest of the matches sailed round the Island. The Yacht Club did, however, make considerable progress as an institution, and by 1824 its membership list had increased to 71, with an addition of 132 honorary members. The Thames Club had likewise enlarged the scope of its energies. In 1823, the year of the Coronation of George IV., an important match was sailed among the yachts of the Cumberland Fleet for a cup pre­sented in honour of the Coronation. It is in this year also that we find the Cumberland Fleet being styled His Majesty’s Coronation Sailing Society, and owing to a dispute in the same year the Thames Yacht Club was formed. It is significant of the activity of the Thames yachtsmen that in 1828 there was again a dispute, and the Clarence Yacht Club was formed, and existed for a number of years. These facts are fully recorded under the general history of the Royal Thames Yacht Club. Thames yachting had, without doubt, attracted the attention of Southern yachtsmen for a number of years prior to the founda­tion of the Yacht Club at Cowes, but it is not till the year 1824 that a visit of Southern boats to the Thames is recorded. In that year a boat from Southampton and another from Cowes sailed round to the Thames. The racing records of the Thames Club do not record any matches having taken place. In the following year, however, Mr. J. M. Davey, the owner of the Don Giovanni, 11 tons, one of the most successful of the Thames boats, issued a challenge ‘to sail with any vessel near her tonnage at our annual regatta . . . for from £100 to £250 a side.’ The Don Giovanni is here described as an ‘out-and-outer,’ but the challenge was taken up by Captain Lyons, who built the Queen Mab, and the pair duly appeared in Cowes Roads. Mr. Davey appears to have been doubtful of the tonnage of the Queen Mab, he having limited his challenge to a boat of 12 tons or under. Captain Lyons offered to bet £50 that his boat was within the prescribed tonnage, and further offered to forfeit the stake of £200 in the event of his winning. The matter was not settled, and the Queen Mab was awarded the race. The Thames boat appears to have cruised westward after this fiasco, and we next hear of her at Dartmouth, where she was eventually sailed against the Queen Mab, and defeated. The Royal Yacht Club inaugurated cup-racing at Cowes in the year 1826 at their annual regatta, which extended over two days. The first prize was a gold cup, value £100, offered for vessels belonging to the club of any rig or tonnage. Prizes of £30, £20, £12, and £8 were offered for vessels of all descriptions not exceed­ing 40 tons, belonging to any port. The vessels entered for the club race were: Menai, 163-ton cutter, owned by Mr. Assheton Smith; Harriet, 95-ton cutter, owned by Lord Belfast; Arrow, 83-ton cutter, owned by Mr. Joseph Weld; Emerald, 63-ton cutter, owned by Mr. J. L. Symonds; Dolphin, 58-ton cutter, owned by Captain P. Browne; Elizabeth, 55-ton cutter, owned by Mr. Magniac; Elizabeth, 42-ton cutter, owned by Lord Darnley. The match was won by the Arrow, with Harriet second and Menai third. To Mr. Joseph Weld, one of the earliest and most enthusiastic yachtsmen, fell the honour of winning the first cup offered by the Royal Yacht Club. The Arrow, like her owner, figures prominently in early British yachting. She was built by Inman at Lymington in 1821, and even at this date was reckoned a famous boat. The cup-racing thus inaugurated in 1826 was crowned with success in the following year, when His Majesty King George IV. offered a challenge cup to be sailed for annually by yachts of the club on his birthday, August 12. The cup was of the value of 100 guineas, and was of the model of a tankard, bearing the royal arms and with a bust of the King inside the cover. The winners of King George IV. Cup are given in atable (refer to the pdf version). Royal patronage led to a tremendous impetus in Cowes yacht­ing, and the competitions became extremely keen. For the race in 1827 there were six entries, and the sailing appears to have been of a neck-and-neck character. In 1828 regulations were put into force. Trimming of ballast and booming out were prohibited. No member was allowed to enter more than one yacht. It was also decided that an honorary member of the club should be on board each yacht sailing for a prize. The race of 1828 was a memorable one, and lay between Menai and Lulworth, the latter winning only by a second. Alarm, R. Y. S., 248 tons. Owned by Joseph Weld, Esq., Lulworth Castle. Originally cutter of 193 tons, in 1852 lengthened by 20′ at the bow and rigged as a schooner. Belfast, Mr. Weld and Mr. Smith refused to sail their yachts against him. 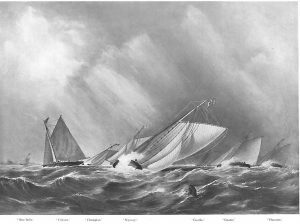 As to the merits of these disputes we are not concerned, though they appear to have dominated the whole of the sport in the Solent for some seasons, for at the Ports­mouth Regatta Mr. Weld and Mr. Assheton Smith refused to race their vessels against Lord Belfast’s boat, and the feud was continued at Cowes. Later, however, differences were more or less com­posed, and Lord Belfast challenged Mr. Weld to sail a match between the Louisa and the Alarm for £1,000, a challenge which Alarm’s owner promptly accepted. In this race Lord Belfast had the extreme satisfaction of soundly beating his rival’s boat. It would be a mistake to suppose that interest in yacht-racing was in these days confined entirely to the Thames and the Solent. At Plymouth in 1825 a regatta was held, the funds being subscribed by the townspeople, and the course laid out was twice round the Sound, mark-boats being placed at Penlee Point and off Stadden Heights. As far as one can gather, the yacht-owners taking part in this match were Captain Lockyer and Messrs. W. S. Harris and Mr. Fox. In 1827 the Duke of Clarence, then Lord High Admiral, visited Plymouth, immediately before the Battle of Nava­rino, and the occasion was celebrated by the formation of the Port of Plymouth Royal Clarence Regatta Club. This club had a pros­perous and useful existence, and was supported by a fairly numerous body of resident yachtsmen, who assisted at the annual regatta in the Sound. On the Clyde and in the North of Ireland the sport became established, and the Royal Northern Club was formed in Belfast in 1824, being joined by the Clyde division in 1825. The Irish and Scotch divisions existed for some years, but they appear to have attracted very little notice in England, though the Clyde yachts were in every way equal to those found in the Solent. In Dublin Bay the Marquis of Anglesey organized sailing matches as early as 1829, and to these matches may be traced the formation of the original Royal Irish Yacht Club, which held its first regatta in 1832. There was, indeed, at this period a number of regatta committees in existence, many of which, doubtless, were formed as a result of the matches sailed by the revenue cutters, and later supported by members of the Royal Yacht Club; and though public interest was centred in the doings of the large and handsome yachts owned by wealthy men, the smaller regattas attracted no little attention. 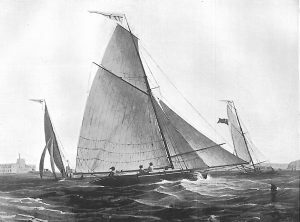 The first attempt to classify racing yachts was made by the Royal Yacht Club in 1829, in connection with the Cowes Town Cup. 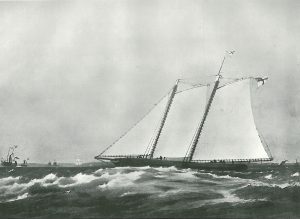 The competitors were grouped into six different classes, ranging from vessels of over 140 tons to those under 40 tons, and the handi­cap was made in proportion to the distance of the course, the first class conceding ½ mile to the second class, the third class 1¼ miles, the fourth 2¼ miles, etc. This system of classification and handicap was revised by the club two years later, and though the six classes remained, their position was reversed, the first being the smallest, under 45 tons, in which a difference of 5 tons was allowed, and the sixth the largest, where a difference of 3o tons was allowed. The classes did not meet each other, prizes being allotted to them in their classes. It was this classification which brought to an end the supremacy of the big racing yachts owned by wealthy yachts­men, and the final blow was received when King William IV. commanded that His Majesty’s Cup should be sailed for under this classification. The Royal Irish Club also instituted a time allowance for the Anglesey Cup, the calculation there being made on the yachts starting from the mark-boat. At various centres of yachting activity the question was being continually raised, and one plan which received a trial was to start all classes at once, and to mark the time on their return. It was not till 1838 when the first of Queen Victoria’s Cups was competed for, that another experiment was made in handi­capping, this time by time allowance. The race was open to yachts of all classes, and a time allowance of three minutes for every 10 tons of difference was reckoned at the start of the race. This was by no means a solution of the difficulty, and the Royal Cup was again presented to various classes – cutters, schooners, and on one occasion square-rigged vessels. In the year 1841 the Sailing Com­mittee started all the yachts together, with a time allowance of one second per mile for every ton of difference between competing vessels. In 1843 yachts were re-classified under two headings, these being cutters and schooners. The cutters were formed into four divisions – viz., 30 tons and under 50 tons, 50 tons and under 75 tons, 75 tons and under 105 tons, 105 tons and upwards. The schooners were formed into two divisions – viz., 140 tons and under; over 140 tons. A new system of time allowance, devised by Mr. George Holland Ackers, and known as Ackers’ Graduated Scale, was also brought into use at this time. The Dophin Yacht, 1849. (Also showing Sunbeam and Anaconda). Mr. Ackers was a member of the Royal Yacht Club, and owned, in 1837, the 217-ton schooner Dolphin, and later the Brilliant and Rose Diamond. The introduction of the Ackers’ Scale brought about a great improvement in yacht-racing, and in 1843 a cup was offered at Cowes for competition among yachts under 35 tons belonging to any royal club in the kingdom. The competing vessels were drawn largely from the Royal Thames Club, and the prize was won by the Champion, owned and sailed by Mr. H. Gunston. Mr. H. Gunston was part owner with his brother, Mr. G. Gunston, in a number of Thames yachts, including Sabrina, 21 tons, and Gazelle, 25 tons. The ‘Champion’. Property of Mr. Geo. Thornton. Built by Underwood, 1846 (from an original painting). The Champion, with which he won the Solent race, first made her appearance in Thames matches in 1841, being owned by Messrs. T. and J. Wanhill. She was purchased by Mr. Gunston in 1842. 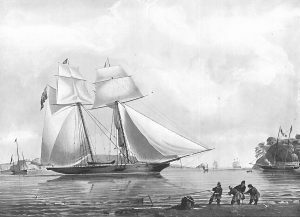 Iron Yachts Mystery and Blue-Belle in the Match sailed May 25, 1843. Representing the position of the yachts at False Point, where the Mystery passed the Blue-Belle between the Latter yacht and the shore, left her aground there and won the cup. The 25-tanners of the Thames aroused a good deal of enthusi­asm at this period, and the Mystery was sold by Lord Alfred Paget to Lord Seaham for £500. Match at Cowes for a Cup given by members of the R. Y. S., August 14, 1844. Won by the Mystery (Viscount Seaham). It was in 1844 also that the first iron-built yachts – the Belvi­dere, Bluebell, and the Ariel – were raced at Cowes. In the first contest these novelties were defeated by a wood vessel owned and built by the brothers Wanhill of Poole. Organized yachting made rapid growth at this period, and quickly attained generous proportions. Sixteen Royal Clubs were in existence in 1850, as follows: Royal Yacht Squadron, 1815; Royal Cork, 1828; Royal Thames, 1823; Royal Northern, 1824; Royal Western of England, 1833; Royal Western of Ireland, 1832; Royal Eastern, 1835; Royal Southern, 1840; Royal Harwich, 1843; Royal Mersey, 1844; Royal Victoria, 1845; Royal St. George’s, 1846; Royal Irish, 1846; Royal Welsh, 1847; Royal Dee, 1847; Royal Yorkshire, 1847; Royal London, 1849. The year given is that in which the clubs received royal patronage. In 1850 the Royal Yacht Squadron’s fleet of yachts consisted of 100 vessels. The Royal Thames numbered 130. The Royal Western numbered about 8o, though when united with the Royal Western of Ireland the fleet consisted of 127 vessels. From the formation of the Royal Thames Club in 1823 to the year 1850 considerably over 100 matches were sailed on the Thames, and for these matches almost as many cups and trophies, ranging in value from 25 to 200 guineas, were presented. In local waters the newly created clubs followed the excellent lead of the Royal Thames in encouraging keen rivalry in small-yacht racing. The Squadron, however, remained aristocratic, its fortunes being guided by Lord Yarborough, its first Commodore, till his death, which took place in 1846, on board his yacht Kestrel, at Vigo. Lord Yarborough’s death was a great loss, and there followed a period of dissension and depression in Solent yachting, due largely to the election of the Marquis of Donegal, who was unpopular with a section of the members, as Commodore. The Marquis resigned his Commodoreship in 1848, however, and the Earl of Wilton was thereupon elected. A pdf version of this Chapter is available here. Read on … Chapter 5 – Visit of the America 1851.